Remember a few years ago when people were laughing at Jamie Oliver and his Food revolution series on TV? Well I don't hear anyone laughing now. Last week, due in large part to Oliver's efforts, McDonald's, Burger King and Taco bell announced that they would no longer use beef treated with ammonia. This type of beef has become known as "pink slime" and is actually the leftover seemingly unusable beef scraps bathed with ammonia to kill any e-coli. salmonella or pathogens. The only way to avoid pink slime beef is to buy organic beef. 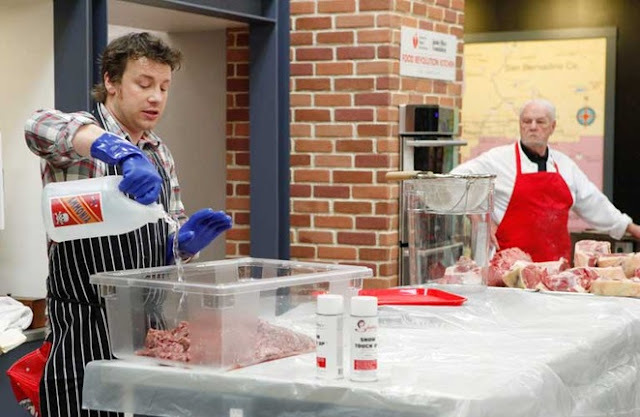 Currently, the USDA (United States Department of Agriculture) allows "pink slime" to be in an estimated 70% of US ground beef products (sold to restaurants, schools and you at your local market) without labeling the beef as treated with ammonia. With last week's announcements, that number should certainly fall below 70% but this year the USDA still ordered 7 million pounds of pink slime beef for use in US public school lunchrooms. There is a better way. For your family, be sure to buy grass-fed, organic beef and unless you are up for a challenge, pack your kid's lunch for school. If you are up for a challenge, take a page out of the 2,550-pupil Granville School District in Licking County about 30 miles east of Columbus, Ohio to your school district. They hired an executive chef and sous chef with restaurant experience, invested in the necessary equipment needed for cooking healthy, from-scratch food and worked with local farmers to locally source 40% the district's lunchroom needs within 125 miles from the school. Oh and did I mention that Granville students eat off of real plates and use real silverware? 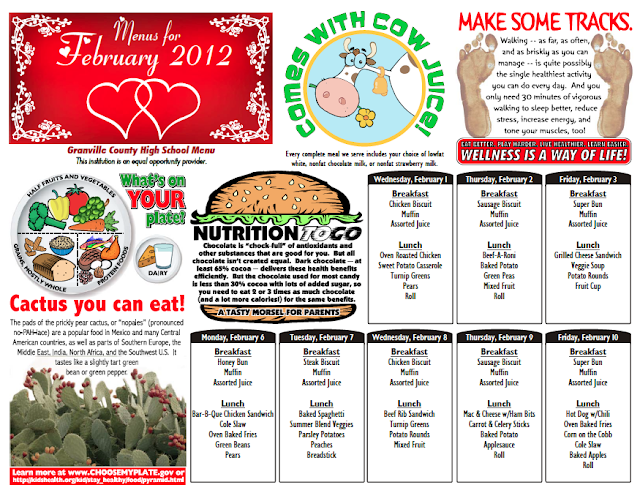 How is that for good for you and good for the planet meals? 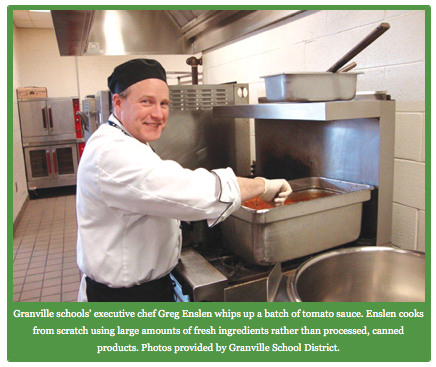 Granville schools’ business manager, Chuck Dilbone, is the force behind the district’s successful, local food initiative and feels that the model could be replicated throughout the country but “Unfortunately we don’t do a lot of cooking in schools—we do a lot of heating, thawing and opening of cans." For those that try to create a healthier, more beneficial school lunchroom, overcoming the hurdle of school kitchens not created for cooking (but instead for re-heating) leads to yet another hurdle for schools to conquer, using subsidized government commodities which are essentially free. From "pink slime" beef to processed, HFCS (high fructose corn syrup) infested GM (genetically modified) snack foods, schools use the excuse of tight budgets and ignore the link between high quality foods and test scores and serve the low-quality government food. According to David Ludwig, director of the obesity program at Children's Hospital in Boston, schools source almost 20 percent of their food from the government commodities program. "School districts are under intense budgetary pressure, and often-times nutrition is at the bottom of the priority list," said Ludwig. 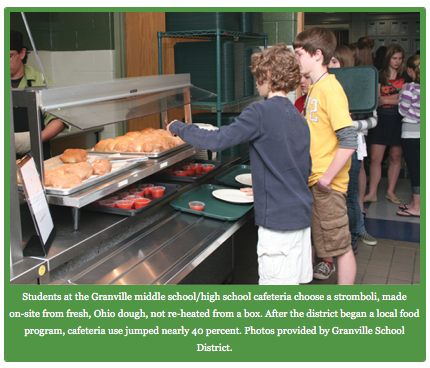 If we could change the perception of food as merely a low-grade, low-cost commodity in our public schools to food as a necessary high-grade fuel for the bodies and brains of tomorrow, perhaps our entire country could experience the success of the Granville model. 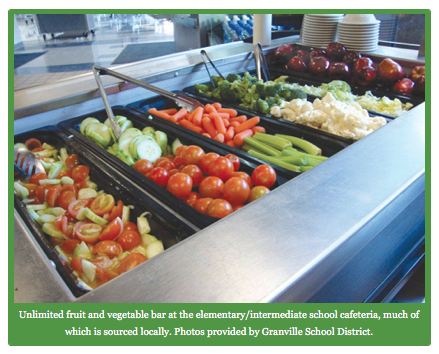 After just 3 years of the Granville healthy lunchroom program, the only problem they encountered was that students were taking too many fruits and veggies from the schools' unlimited fruit and veggie bar. “That’s not a problem!” Dilbone responded.